How well do we know our students? They sit in our classrooms five days a week, we certainly spend lots of time with them, but how well do we really know them? How well do we know their thoughts, their worries, the things they obsess about? And how well do they ever get to know us beyond our role as a teacher? I’ve been hammering away at the importance of the teacher-student relationship for about as long as Cult of Pedagogy has been a thing, but every now and then I come across a method or approach that can really help build those relationships more effectively. 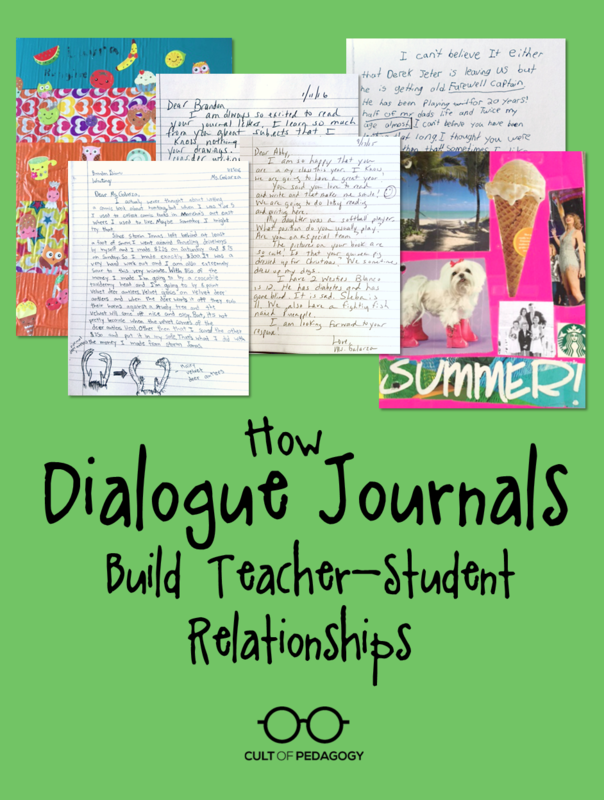 My friend Liz Galarza, who teaches middle school writing in New York, has been telling me for ages about the dialogue journals she uses with her students and how transformational they have been in building relationships. The journals had such a profound impact that Galarza made them the focus of her doctoral dissertation. A dialogue journal is any kind of bound notebook where students and teachers write letters back and forth to each other over a period of time. This is very similar to the kinds of journals described in Smokey and Elaine Daniels’ book, The Best Kept Teaching Secret, but since Galarza has had such powerful experiences with these journals, I thought another post was merited. In the first few days of school, Galarza gets to know her students through intake forms (not included in the journals) where she asks students to tell her five things about themselves that she wouldn’t be able to tell by looking at them or their school records. Next, she goes into the journals and writes the first entry, starting with a very general welcome, then beginning to connect with students based on things they wrote on their intake forms. 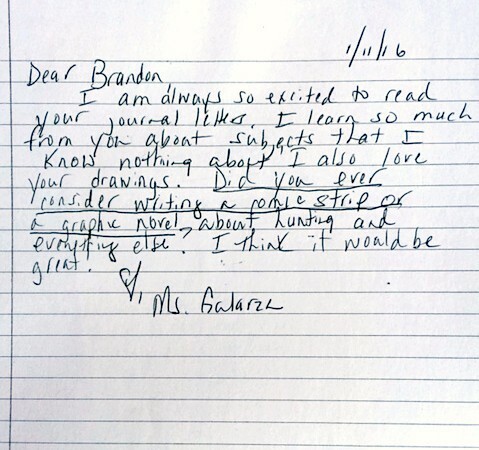 Once the teacher’s first letter is written, students write back. 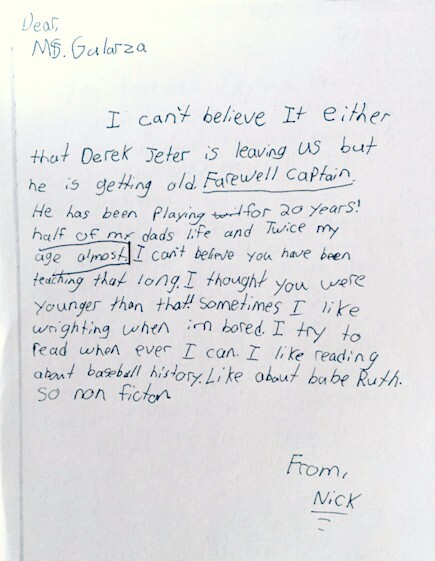 In this sample, Nick responds to Galarza’s opening letter, where she mentioned Derek Jeter leaving the Yankees. “In his intake sheet, every single thing he wrote about was about baseball and the Yankees,” so Galarza made sure she mentioned that in her first letter. As the school year progresses, the journals go back and forth between teacher and student. Galarza asks students to write one letter a week, although some students write more often than that. About once a week, Galarza will ask each class period to hand in their journals, staggering these on different days so she only has one class period per day to respond to. She takes about an hour to respond to a single class set of journals, so if it’s a busy season, she may end up only collecting them every two weeks, rather than once a week. Writing Fluency: When students write in dialogue journals, there’s no pressure to fulfill an assignment or construct perfect sentences. Students just write. And the more a person writes, the more confident they become and the better their writing gets. If the teacher can identify topics that are important to the student, this can inspire far more writing than a student would ever produce for an assignment. Nick, the student above who wrote about Derek Jeter, initially told Galarza he hated to write. After their first exchange about the Yankees, Galarza says the topic stayed with them for the rest of the year, and Nick ended up filling more pages than any other student that year. Mentor Texts: As the teacher and student go back and forth, students pick up on the teacher’s style of writing, and the teacher’s letters effectively become mentor texts. For example, when Galarza responds to her more advanced writers, “I might use a more complex sentence structure. I might combine sentences or use phrases and just more sophisticated language.” Often she notices students using these same structures in their own responses. Relationships: Ultimately, the most important benefit of the journals is the relationships they build. When students feel they have a trusted adult in school, when they feel heard and seen, that makes school a place they want to come to. Very interesting! I am saving every Friday for journaling this year with my high school science students. Maybe this is where I should start; it could be once a month with the other journaling in between. I like your ideas. I am a veteran teacher. I used dialogue journaling during the whole language trend during the 90’s. It is a wonderful tool for connecting with students and the content areas. My students loved this activity and so did my parents. I am surprised but happy to see some of the better trends recycled. Great idea! I have a smaller class than I’ve ever had this year, and this looks like a wonderful way to encourage writing and build relationships. I love this idea, but I worry about being able to keep up with it, and wonder if starting, then not following through would do more harm than good. I do a TGIF journal with my students where they write home to a parent or aunt every Friday and tell them about the week, what we’ve studied, etc. Parents are then asked to write back. Most do, some don’t. I like the idea of switching it up and some weeks writing home and some weeks writing to the teacher, another week a peer. This is how I’ll mix it up as I know I couldn’t keep it up. Have a great teaching year. Writing to a parent is a great idea! Thanks for sharing. Let me know how it works to change things up. Have a great school year! I’m worried about keeping up as well! I have 50 students, and I’d have to figure out a rotation. Any suggestions on management? I have tried it many different ways, but what has worked best is receiving about 10 books a week. I post a schedule and the student knows when they must submit. This way you are only answering 10 a week, but are constantly receiving books. I hope that makes sense! Time management was my concern as well, but the idea of only 10 at a time works. It’s January, but I think I am still going to try this with my 5th graders. Thanks for sharing! I would bet that once you start writing with your students, you will not want to stop! I do not think it would be harmful. As a suggestion, you could start with everyone and then just continue with the students that really WANT to do it. This way, you will not feel overwhelmed. I would be interested in hearing how that works. I’m so impressed by the dedication and care put into dialogue journals. This reminds me of literature letters, which my teaching methods professor, Jim Mahoney, had us write during one of my final college classes. Each week, students wrote a letter to each other about one of the class readings, and every few weeks, each student was responsible for writing a letter to Mr. Mahoney. The casual dialogue between students and student to teacher about the course content and life in general deepened the class experience so profoundly. I can only imagine that the dialogue journals have the same impact on you and your students. Thanks for your comment! I am sure the experience that you had in that methods class had a significant effect on your learning. When you build trusting, caring relationships, students and teacher engage more authentically and REAL learning takes place. Love this! My kids keep “day books” and some of their journal entries are like the dialogue journals. I respond to their entries with comments, but I love the idea of a teacher’s reply as a mentor text. I will definitely keep that in mind as I begin this new year. Thank you for sharing. Thanks so much for your comment! I would love to hear how the journals work in your class. Thanks for the feedback. You can try it with just one class and see how it goes. Stagger the submission so you are only receiving about 10 books a week. This may be doable Let me know! Thank you for sharing this idea. I also wonder about the time investment, but the benefits you write about are inspiring – individualized instruction, ongoing assessment, and teacher letters as mentor texts. And of course, relationship building. Thanks for your comment. Yes! The benefits are awesome. I hope you consider trying it. Keep me posted! Liz and Jen, I SO appreciate the depth of this topic you’ve presented here. Thanks for the models/examples provided because it makes educators more likely to adopt this activity with students when they see the process. Thanks so much, Leanna! Please share your experience with the journals and have a wonderful school year! 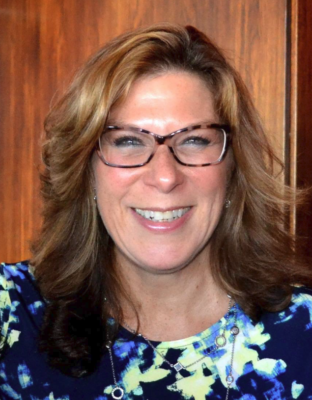 In the 1980’s, Leslee Reed taught across the hall from my classroom – and saved my sanity by sharing dialogue journals for use in my multilingual-cultural sixth grade class in downtown Los Angeles. Their personal and classroom relationships supported academic learning at all levels in this class of diverse students. In subsequent duties in 4th, K, 1st, remedial reading groups, and then ESL classes in Roatan, dialogue journals remained crucial lifelines. I’m grateful that their use still sustains learners in this number crazed data era. Oh, WOW!!! I am so glad to hear from you, Sarah! I wish I could speak to Leslee Reed. I have read so much about her while doing my research. I feel the same way with regard to the present academic climate. But..it is possible to use these types of classroom practices even with our data driven profession. It was a great idea to have the kids write you the first letter! There is a sample of a first letter in the blog post. I hope you are enjoying using dialogue journals with your students! I was recently hired as an ESE (special ed) support facilitator in a middle school and will be working with my caseload in regards to behavior and what they need to do to be successful in class. I am definitely going to incorporate this. I have used a mailbox in the past to let kids write to me about whatever they wanted to, but I like the consistency of the dialogue journal. Thanks! I would love feedback on how they are working for you! Do you think this would work if it was digital? Email rather than journals, or would that take something away from the experience? (1) Accessibility: You could catch up on dialogue journals at work or at home, or on a smartphone or tablet. This would be much easier than hauling crates full of journals home with you. (2) Commenting system: With Google Drive’s comment system, you and the student would be able to comment on individual parts of each other’s letters by highlighting a particular word or section and adding a margin comment. While this is possible in a physical journal, it could get messy quick, and you’d be limited in how much space you’d be able to use. With Google Docs, you could do margin comments AND a separate letter that follows the student’s entry, which could offer a lot of different ways to interact. (3) Hyperlinking: In a digital environment, both you and the student could hyperlink to other resources and media that connects to the topics you’re discussing. These could range from a quick lesson on mechanics (if you notice a student attempting a sophisticated sentence structure but not quite getting it) to a link to a song or video one of you wants to share. Over time, each student’s dialogue journal would be a rich, layered, personal collection of multimedia they’ve built with you. Sorry that I did not see this earlier! I agree with everything you said above, Jen, and I LOVE the hyperlinking idea. I think it is a personal decision, and you should do what works best for you. I kept the journals in written form even after I was using Google Classroom and assigning everything else in my class through Google. There is something very special about using your own handwriting and being able to draw, paste in pictures (I know this could be done electronically) and decorate the cover. It was my preference, but I do not think there would be negative effects if they were done digitally. The most important reason to use dialogue journals is to create authentic connections with students. I created on line journals (courtesy of Alice Keeler) and put them in the google classroom. I think I will concentrate on including the dialogue aspect to them. I do comment on their entries each time, but something more personal would be a great addition. I have utilized dialogue journals in my classroom and LOVE them! I am interested in moving to a digital platform. Could you explain what you loaded to google classroom? I’ve thought about starting a google doc but was wondering about other options available. Thanks! Has there been success with this in the elementary classroom? Hi Mel! Yes! Yes! Yes! I used dialogue journals in my 5th and 1st grade classrooms — LOVED them! They were absolutely a great means for relationship building — my favorite part was writing back — validating and empathizing and laughing in response to their messages. I also came to realize I was able to naturally differentiate and nudge writing progress with each entry by crafting responses with intention. Kids eagerly looked forward to my responses, paying attention to how I wrote back…noticing crafty use of punctuation, changes in text size or line spacing, and purposeful word choices. They also got to know me better on a personal level. We know the power of modeling. Dialogue journals give kids of all ages an opportunity to get that bit of personal attention from their teacher through the art of written communication. I gave up dialogue journals one year because there was so much other stuff to do…that was about 15 years ago…still remember it and still regret it. Thanks for posting that comment, Debbie. It sounds like you really enjoyed writing with your students in dialogue journals. Too bad there is so much time spent on things that don’t yield such positive results! Did you give them another try? Thanks so much, Liz!!! Oh, yes — after that year when I didn’t implement dialogue journals, I absolutely went back to them every year after that! I don’t know what convinced me to let them go that one year since I’d been using them for years and years prior to that. I vaguely recall thinking their Response Journals could serve the same purpose, but they didn’t. Not even close. The silver lining was that it just confirmed what I knew all along – their power. And I agree with you … in many cases, so much time is spent on things that don’t have nearly the impact. Thanks for all your insight! Hi Debbie. I have been using “Seed Journals” (Writing grows throughout the year as a seed would) with my first graders for the past five years. I absolutely love it. Occasionally, some of my firsties can’t read my response so I tell them to ask a friend. However, some of the kids write personal information and don’t want others to see it. I have no problem reading it to them but then it creates a “Monkey See, Monkey Do” scenario. As a result, I have a line of 24 kids wanting me to read their responses as well. Any suggestions? Yes — some little ones struggle reading our replies, especially at the beginning of the year. Because of that, I tried keeping in mind what I knew about them as readers and writers. My goal was to reply with a meaningful message they could likely read with independence. That meant differentiating by strategically using mostly known words and including just one or two unknown words they could solve using context or reading strategies. Having said that, I still had a system in place to avoid those long lines from developing. Usually, I returned journals to tables in the morning before school started (or before leaving the night before). When kids arrived, I was busy making connections, circulating the room and touching base with everyone. After they took care of their morning routines, they’d go to their table to read their journal. They knew I’d be coming by and if they wanted my help, they’d need to be prepared. That meant telling me exactly what they needed help with and what they already tried to do on their own. This led to some self-direction, accountability and eventually more confidence. On my end, it also served as a bit of a formative assessment. If a student wasn’t prepared, I just told them I’d swing back if there was time. These norms were set from the beginning. We decided it was a respect thing. I was already talking to someone and besides, I was a really bad multitasker! I also told them I’d never want to waste their time, having them wait in line for me. That wouldn’t be nice. So again, a respect thing. What if time ran out and I didn’t get to everyone? Kids knew they could bring their journal to a Readers or Writers Workshop conference, or they could put a post-it on their journal, requesting a conference. Then I would meet with them at my convenience. Another thing I did sometimes: return just a handful of journals a day, trying to make sure no more than 1-2 would need help. I think the main thing is to find some sort of system that assures the kids that there’s a system in place and options for meeting, but standing in line just isn’t one of them. Hope there’s something here that might be of help! I teach Prek at a public school and love this idea, however my students often forget what they write or draw. Do you think I could do this, but have the parents help with the students’ responses? How often do you write to each student? Yes, I think you can do this! Go for it and see what happens! Here’s my advice…check out Matt Glover’s book Engaging Young Writers as well as Already Ready by Matt Glover and Katie Wood Ray. I know it’s so tempting to want to write for kids, but there’s a couple of really good points that Matt makes that helped me understand why we don’t want to really do that. We want kids to truly see themselves as writers. If we write for them, using conventional writing, Matt points out that that won’t help a child reread what they wrote anyway. If we write for them, we aren’t going to find out what they are able to do on their own and we won’t know what they are ready to do next. If we write for them, then we run the risk of jumping developmental stages and sending the message that children aren’t really writers…only adults are writers. If kids are forgetting what they drew, then we can look closely at what they are doing, honor their approximations and teach them a strategy that will nudge them to that next step. How often did I write back? Once a week. I intentionally crafted my responses so kids could “read” my pictures and see something in my writing that they might want to try in theirs. Hope this helps…and check out those books…they’re great! Sorry, Mel! I did not see this until now! YES! Debbie Sachs explained it just as I would. Along with building trusting relationships with students, the writing your students do is a formative assessment. Debbie explains that beautifully! The modeling aspect that was mentioned is also key. They are seeing a correctly written letter with possibly new vocabulary, sentence structure and punctuation. It is almost like a private lesson without explicit instruction. I did create mini lessons based on “errors” that I saw within letters, but I never corrected or graded the journals. Although time consuming, it is time well spent! Absolutely! I start my year by writing to my 4th graders. They write back to me once a week. It has been really foundational in building relationships and a great preassessment strategy. Plus I love all the amazing things they know and share. As a side benefit, it has really impressed the parents too. I have a class of just under 20 so I can do it each week. Has anyone used these in a high school biology course, even an AP science course? I’m curious about having the students do a journal where they tell me what they are understanding versus what they are struggling with in class. I wouldn’t be using it to get them to write, but to get a better feel for how they are grasping the material. I love the idea of building trust with my students through journaling. I am able to build an easy rapport with my students, and trust with most of them in class, but it can be hard to get to the students who struggle with the subject. Feedback would be appreciated! Sorry it took so long to respond! I just saw these comments. Although what you are proposing is not really a conversation with students, you can still use the concept to ascertain if they are understanding content. You will be able to build rapport, but it will not be an organic conversation. You are directing it. I would try it and tweak it as you go along. Using dialogue journals to replace reading logs sounds like a great idea! It would be more like a literary journal or a reading response journal, but connections can be built, for sure! I have not used them at a high school level, but I believe, that if students could buy into it, the timing would be perfect. They are at a transitional time of their lives and need teachers to be authentically available. I would love to hear how they worked! I really enjoyed reading this. I’ve been keeping weekly Reading Dialogue Journals with my upper primary students for years. We mostly write about books and ourselves as readers (in the style Nancie Atwel described in In the Middle), but the formative writing opportunities and especially the personal connection have always been so beneficial. Recently, due to a wrist injury, I switched over to “video- letters”. With many students, I found they actually ended up sharing a lot more thinking about reading. I was thinking of switching to video – letters next year, but didn’t want to give up the handwritten letters. Now, I’m inspired to have video letters devoted to reading and dialogue journals for any topic – maintaining the personal connection and writing, while getting the most out of our reading conversations. I have a class of 20 fifth graders, so weekly has been doable up until now. Great food for thought! Thanks so much for your comment, Lauren! I love the “video-letter” idea; it makes it even more intimate! Talking about books and reading life, a component of readers’/writers’ workshop is very powerful! Nancie Atwell’s book In the Middle explains the importance of these types of journals. The big difference between literary journals and dialogue journals is that there are no prompts or preconceived ideas about what will be written in the letters. Students choose what they will write about and how they will write it. This is what softens the power differential and leads to mutual reciprocity. I think that ANY writing with students where they can really get to know you is going to yield positive relationships. Thanks again! I read this post at the beginning of the school year and was inspired to try it with one of my classes. I’ve been at it for a year now and definitely see the benefits! Dialogue journals have especially helped me to get to know my more introverted students. However, I am still struggling with keeping the dialogue journals more student-centered by not asking questions, as this post suggests. I tried that for awhile, and students would keep coming up to me and telling me that they had nothing to say. I noticed that this problem decreased if I started asking questions, but I definitely saw how asking direct questions also made the activity more centered around me. Any suggestions? Generating writing topics can be a struggle for a lot of kids. And when it comes to dialogue journals, kids may feel particularly vulnerable because they are sharing a bit of themselves, wondering if the reader is interested in what they have to say. They also might need help understanding that sometimes the littlest things in their lives can be written about in a big way. Here are some things that I did in the classroom (with 1st and 5th graders) that seemed to be effective…first and foremost, I modeled! I shared my own dialgue entries all the time. Sometimes I had entries up on the smartboard as kids walked into the room or at the beginning of a mini-lesson. I shared stories all the time…little stories, in a big way. All the time. Any time. Like how I couldn’t find my car keys that morning. And I’d tell them in a really detailed entertaining way. I shared things I heard on the radio, funny things I saw on tv, and then sometimes I asked their opinion about it. I’d share conversations I overheard that made me think. When engaging in conversation, even during transitions or in passing, I noticed when those struggling writers started engaging back — that’s when I’d get all excited and say, “Ah! Here’s a post it! Jot this idea down really quick and stick this in your journal. You can write about this — I can’t wait to hear more!” Giving kids time to share some of their favorite entries with each other can spark ideas as well. But mostly, I really found that whenever I shared my own entries and whenever I got an idea for my own journal, it helped kids to see their world a little differently…a world that held all kinds of stories. 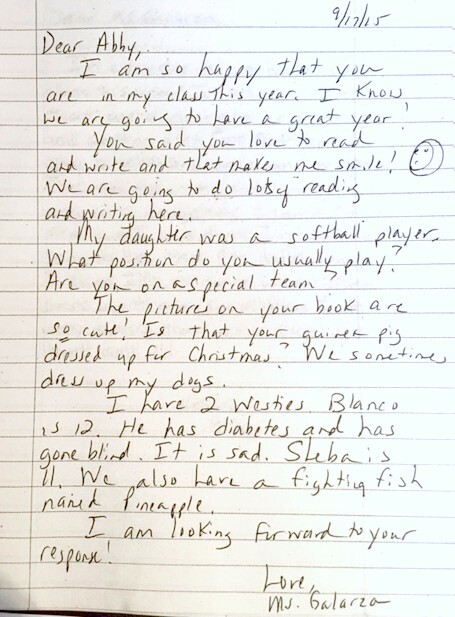 One last thing…give your own journal to a kid and ask them to write back to you. When they read your entries, they’ll see the kinds of things people can talk about. Hope this helps! Thanks for the specific feedback! I am looking forward to trying these ideas next year! You bring up an important point. How do we get reluctant writers to write a letter to their teacher without directing the conversation with prompts or questions? This is a tough one! At the very beginning of the year, I ask students to write at least 5 things about themselves that I would not know already. When the conversation starts to lag, I talk about one of those topics. For example, if the student said they were a younger sister, I may write about my older brother. This often gets them writing about their older sibling. Sometimes I go back to earlier letters and restart a conversation. But if asking a question is the only way they will write, then do it! You know intuitively if it is working. Good luck! Thank you for sharing Ms. Galarza’s interview. I had come across the blog post prior to listening to the podcast and I am so thankful I took time to listen to the podcast. This will be my 5th year teaching in the classroom. I have been doing dialogue journals with my 9th and 10th graders since my second year of teaching. However, I didn’t realize it was a ‘thing’ until I came across this blog. I, too, have had very similar results and outcomes of cultivating relationships with my students. What prompted me to leave a reply to your post is what Ms. Galarza had said about “students not needing me to teach them, but for me to care.” Yes! Yes! Yes! Not to get on a huge soapbox, but this is what all of our students need. I’m sure you agree that high school students are just like the younger kids, just in bigger bodies. They want to be loved and accepted too! The more I listened to Ms. Galarza, the more I felt like I had found a kindred spirit. Thank you for providing this venue for teachers to learn, to be inspired, and stay motivated! Thanks so much, Tiffani! Yes!! You have found a kindred spirit. I want to commend you. It is not easy to incorporate dialogue journals as a new teacher, and you stuck with it! Bravo! I feel that creating genuine connections with our students is the way to help our youth. They NEED to be seen, heard, tended to, laughed with, and loved. They need adults to trust. They will be much less likely to want to hurt themselves or others if they know that someone (at least one person) cares. Thanks for validating that point for me! What a wonderful idea! I am going to try dialogue journals this year with my third graders. Eight-year-olds usually have difficulty writing more than a few sentences, but maybe these journals will encourage them to elaborate. Thank you, Liz! Thanks so much! Let us know how it is going! I started using the dialogue journals with my seniors in a Theory of Knowledge class. It has been really powerful in terms of building trust and relationships. One of the places I came up with questions to use is the Vogue magazine “73 questions” videos….these enable me to get to know my students on a more personal level and also them to know me! Thanks for the great idea! Thanks for that information. I am going to look into that video. I love hearing how the concept and practice of dialogue journals is being used at all levels. I came across this article on a whim and I love the idea of dialogue journals! This is an idea I’ve been toying with for awhile and just haven’t had the “push” I needed to get them started! Our district has now implemented an Action Research requirement for all teachers and I feel this would be a perfect topic for that! I am most curious to know more about the Student Intake Forms. What kind of questions are on the intake forms and how are they used? Is it possible to share a copy of the intake form you’ve used OR give an example of the questions you pose? Thank you so much for sharing your ideas and suggestions! I am excited to get started! I am so excited that you will be using dialogue journals with an Action Research project. That sounds awesome. Please let me know how it is going, and if you want to share on Twitter @drlizgalarza. I do not ask students questions. Instead, I ask them to tell me 5-10 things about themselves that I can not see with my eyes or read about in the cumulative folder. We brainstorm ideas like: hobbies, interests, favorites, special talents, etc. Additionally, I use information that I obtain from a parent questionnaire that is filled out the first week. (sometimes I mail it before school starts) I can explain that further if you want. I have students ask me questions on that same paper, and I answer the questions as our conversations unfold. I try to keep it as organic as possible; they see through anything that is contrived. They appreciate the authenticity. I hope I have been clear. If not, please write again and I will break it down further. Keep us up to date on the project! I love the dialogue journal and plan to use it this year! That’s great, Benita! Let us know how it goes! Thanks very much for this article! I’ve always loved dialogue journals, but I teach pre-readers/writers. What are some suggestions of similar activities that I could facilitate with five-year-olds? We do “writing” a few times/week, when students draw an illustration and write a few words of a sentence telling a story about their lives, but I’m looking for ways to do this more effectively and make more connections during that time (when my strongest students can write just a few words at a time, and my newer students are not able to form words). Thanks a lot! Hi Madeleine! There’s so much story-telling kids do through their illustrations and different kinds of writing. Here’s an article that I think you might like — Words Don’t Make a Writer: Supporting Emergent Writers Who Are Not Yet Writing Words. I also recommend Matt Glover’s Engaging Young Writers and Already Ready, which he co-wrote with Katie Wood Ray — both are great resources! Hope this helps! Debbi, these are awesome resources! I agree with you about story- telling in kids’ writing. If the students knew that they were writing to you, perhaps you could answer their letters through pictures or symbols. Literacy takes on a different look, but you will still be communicating. Hope this helps! Over the years I have had a number of students who are either selectively mute or extremely shy. Those are the students I usually initiate dialogue journals with. I’ve had some amazing experiences with those students. It has also worked really well in classes where a boisterous few tend to get their voices heard despite classroom management. It allows other student voices to be heard and valued as well. Caryn, you bring up an excellent point about incorporating dialogue journals into the classroom. ALL voices are “heard” and respected. I found the same thing with my shy students. They had lots to say in the pages of the journal. I used to include a “back and forth journal” with student teachers when they were with my grade three class. The student teacher would have a journal that they wrote in all week long….and I would also have a journal that I would write in all week long. On Fridays, we swapped journals. Then we would write back to each other on various pages–just a small snippet sometimes or a longer comment. It varied, depending on the connection to new thinking or questioning. On Monday, we’d swap our journals again and ready what each other was thinking about. Sometimes, the grade three crickets would write something in ‘my’ journal for the student teacher to read. Really cool! Wow! What a great idea! I’m sure it was interesting to see your classroom and students from another perspective. Thanks for sharing this! Jan, that is an excellent idea! I am trying to figure out a way to use the dialogue journals with my student teachers. I am their supervisor, so I only see them once a week. I cannot take the journal from them. I considered trying it electronically, but I feel it loses something that way. I am so confused by how you get this done! I see 180 students a day, and have 30-32 students in a class. Obviously I wouldn’t be able to read a letter and write to 30 students in an hour– the easiest of writing assignments I collect to grade take 2-3 hours per section, and I have 6 sections. How do you manage? I have students write me an email at the beginning of the year (teaching email etiquette!) — kind of like your intake form– but find that it takes me so long to read and respond to each one that I’m often well into the year before I’ve gotten to everyone. I would love any ideas you have for assignment management, because I love this idea but don’t know how to manage it and keep that work life balance! Writing back to that many kids seems daunting! I LOVED implementing dialogue journals, but it was enough for me to write back to just 25 kids each week. In the podcast episode, Liz discusses the possibility of using electronic journals and audio feedback as an alternative management system. You might want to check out Kaizena if you’re not familiar with it already. The thing that’s really neat is you can highlight a portion of the student’s text and leave audio feedback which is a big time-saver. You also have the option of providing written feedback, so based on the content you’re responding to, your method of feedback can vary. You can even add a mini-lesson if you want. This is just a general overview – but it might be a good option and worth trying. Hope this helps! Rachel, I understand how much work that is! I commend you! There is no way that you could effectively write to all of your students. Perhaps you could write to about 45 per semester. Or you could only write one letter a month to each student, while staggering the submissions. Another idea is to only use DJ with one of your six classes. 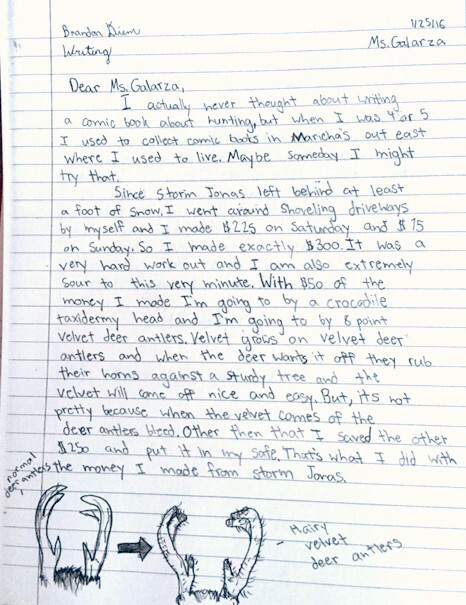 One year I tried having the students write to each other, and then I wrote to both of them once in a while. I did not like that too much, and I lost much of the benefits, but I tried it anyway. I will continue to think of ideas. I work in a Youth Detention Centre and we have had a focus on reading over the last two years looking at increasing our student’s reading skills / interest etc. We’ve been wanting to move onto writing and not knowing a good way “in”. I think I have found a great place to start! Our students have so few opportunities to write, interact with caring adults or feel that they are worthy of being heard. Thanks for a great idea. Kate, thanks for the reply! YES! Writing with these young people will have so many benefits. Their writing will improve for sure, but they will also have an opportunity to “voice” their opinions, frustrations, worries and goals. Someone will CARE about what they are saying and respond from one human to another. Please keep us posted on how this is working. Good luck! I do journaling each day with a more directed topic for them to comment on. What I use for a more personal connection is the website/app ClassCraft. There’s a messaging part where the students can send text like messages directly to me. I’ve learned more about some of them through this than anything else. With teaching middle-schoolers, they are so much more comfortable sharing information through this medium. They ask questions about assignments, questions about what they are supposed to do on homework, and some even send me songs they love that I “have to” listen to. For many of my kiddos I am the only stable adult in their life and I love being able to show them that I care. I have not heard of that app, Mindy. Thanks for sharing! Teaching middle school is tough, and they need someone like you to really “hear” them. I am a high school world language teacher and I find that using the target language can be difficult for relationship building, especially for struggling students. Do you think it would be beneficial to do this but have them write in English? Or would that take away from what I’m trying to teach them in class? Also, I’m afraid of what topics may arise for high schoolers. Nowadays, they can be very open about things that I may be uncomfortable with. I imagine that this could even happen with younger kids. How would you deal with potential issue? As a Spanish teacher myself, I would recommend that you have your students try and stay in the target language as much as possible. One way of supporting them is to provide writing prompts prior to their entries that align with topics and vocabulary you’ve been discussing in class. Depending on their skill level, you could allow them to incorporate various thoughts in English as necessary. Allowing them to use some English could serve a dual purpose of helping them to reflect on their use of the target language (i.e. what specific words or grammar do they need to work on to express their ideas successfully) while also building a positive teacher-student relationship. I also understand your concern about students bringing up topics you may feel uncomfortable addressing. If this happens, aside from a mandatory reporting scenario, I think it’s fair that you just let them know or respond to another part of their dialogue. The main intention of dialogue journals is to build those relationships. I don’t think we’re trying to necessarily get kids to bring up difficult topics; most kids won’t. They just want to talk to you and know that you care. Annie, I agree that it would be difficult for students to express themselves if they do not have the vocabulary to do so. You could have them write using both languages (if they know the word in the language you are teaching, they could use it). That may work (and be pretty cool to read). As far as difficult topics, you need to tell them before you begin that if something comes up that you feel puts them in danger, then you will have to reach out for appropriate help. If I find something disturbing, I ask the student to sit with me privately and we talk about the entry. Often, it gets cleared up in the conversation. Or, I tell them that I will be speaking to the social worker (or principal, or parent, etc). Often, a student writes what they write as a way of calling out for help to someone who they know cares about them. I use reader’s notebooks, which I learned about in the book, The Book Whisperer, by Donalyn Miller. The concept is kids write at the top of the letter a very brief summary of where they are in a book, and then the rest of the letter is their reaction/response to the story. The first year I did this, I tried it just with my tiny 12th grade Creative Writing. I had 18 kids, and I wrote each of them a letter in return every week. Some weeks, only half the class would submit, so I only had about ten to read, yet it would still take me hours to reply. The kids loved getting my letters, and I feel we got to know each other on a very personal level. However, I found it so difficult to just write a few sentences, and when I wrote a full-length letter, it was extremely time consuming. I never would have been able to keep up if they had all turned them in each week. Nonetheless, I am using them in all of my classes this year with all 148 students. OH.MY.GLORY. Impossible. I resorted to smiley faces and “No way!” type comments in the margins because I could not write 100+ letters every week or even every two weeks. I am completely torn, because I love the idea of kids relating to books of their own choosing and writing about it, and I love sharing in their enthusiasm, but I am dying! I finally resorted to a stamping system. Rather than collecting the notebooks every week, I stamp their letter each Friday. At the end of the quarter, they go back and read all their letters and choose the one they want me to read word for word. They get full credit for writing all the letters (which is a huge grade booster for many of them), but I comment on only one. Even with this process, I am still not writing a full letter in response, which makes me really sad, but I simply don’t have the time with all the other work that must be done. Hey Casie – doing dialogue journals with large groups of students is definitely a challenge. Check out Debbie’s comment above, which highlights a tool for providing oral feedback to students who complete electronic dialogue journals. I’d also recommend checking out Jenn’s post on Microsoft OneNote Class Notebook. These are some ideas that might help you find a way to manage doing dialogue journals with large groups of students. I just listened to this episode today, and found it so interesting. Do you think it’s possible to do something like this electronically? I know you talked about it briefly in the podcast, but I was thinking it might be a good way to teach students how to compose proper emails, and then do a similar idea through email. Have you ever tried anything like that, or heard of anyone doing that? I’d love any thoughts you have on that. Anoosheh, I think electronic journals would definitely work! I preferred the handwritten journals, but it could be very successful though email. Good luck! This year, I have really made an effort to maintain individual correspondence with my students. It’s something I’ve always wanted to do, but using physical journals seemed overwhelming to me with 130+ students. At the beginning of the school year, I began looking for an electronic option. I thought about emails, but worried that my inbox would constantly be flooded. I considered using Google slides, but when I explained my plan to a colleague, she mentioned an app called Remind. Remind isn’t new, in fact many teachers use it to regularly send notices and announcements to students and families. However, I tested it out and discovered that I could sort my students into classes and that signing them up could be done through their school Google accounts. Students must be 13 years old to write back using the app. I teach 8th English, so this was not an issue for my classes. Now, I communicate with each of my students through the Remind app/website at least once a week. I have one class period assigned to each day and make sure I provide ten minutes at the beginning of class for them to read what I wrote to them, respond, and respond to the week’s prompt or write about something else of their choosing. I find a prompt is helpful for those who “don’t have anything to say.” Some students write one or two words, no matter what. Some write paragraphs. It has been an invaluable tool in getting to know my students, particularly the ones who tend to be more quiet in class. It does take time (30-60 minutes a day) to respond, but I find that being able to type to them has made responding to each student each week actually possible. This is a great idea! Thank you so much for sharing. Aubrey, that is such a fantastic idea! It is not as much the method of correspondence as much as the connection itself. How wonderful that you have made this a priority. I am sure the 60 minutes a day is paying off. Thanks for sharing! I have tried both the Dialogue Journals with my students this year. IT has been a challenge to write to all of my four classes, but I initiated the first letter, and required a response for the first semester. I have had a few kids who have kept up a regular correspondence with me – a letter every few weeks, and a couple of girls write every couple of days. It has been a fun project. I plan to try to continue next year as well. Just last week we had Kindness Week – the perfect chance for the Compliment Project. These two activities have been quite rewarding for me and my students. Thanks for sharing all of the great ideas here on Cult of Pedagogy. I agree that the Compliment Project aligns well with using dialogue journals. I had the same response. Not everyone buys in. The students that pursue the connection with you truly need it.